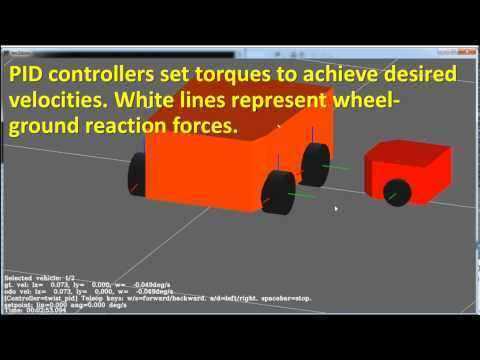 Lightweight, realistic dynamical simulator for 2D ("2.5D") vehicles and robots. It is tailored to analysis of vehicle dynamics, wheel-ground contact forces and accurate simulation of typical robot sensors (e.g. laser scanners). This package includes the C++ library mvsim, a standalone app and a ROS node. The mvsim manual is the main reference document can be found in docs/user_manual.tex. Lightweight in memory, CPU and library requirements. Fully configurable via .xml "world" files. Differential driven (2 & 4 wheel drive). Ackermann steering (kinematic & dynamic steering, different mechanical drive models). Ackermann steering with mechanical differentials of full grade. Laser scanners: Robots see each other, their own bodies, etc. Raw access to forces and motor torques. Twist commands (using internal controllers). Requisites: * A decent C++ compiler! * CMake >= 3.1 * MRPT (>=1.5.4 from 1.5 series; or >=2.0.0): In Windows, build from sources or install precompiled binaries. * Box2D: Will use an embedded copy if no system version is found. This package is already included in OpenMORA.